Summer is in full swing, but the heat shouldn't leave your taste buds unsatisfied. If you find yourself stuck in a salad rut, it’s time to break free. 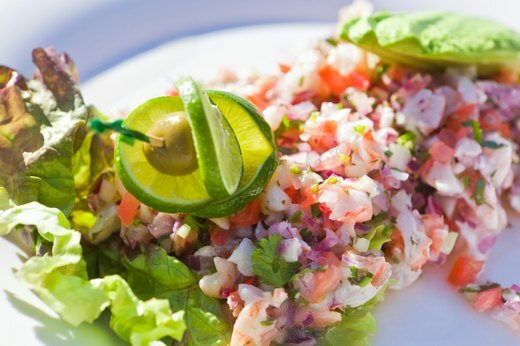 From succulent lettuce wraps to refreshing ceviche, a variety of summer dinners don’t involve slaving over a hot oven. Here are ten delicious options, and not a salad in the bunch! 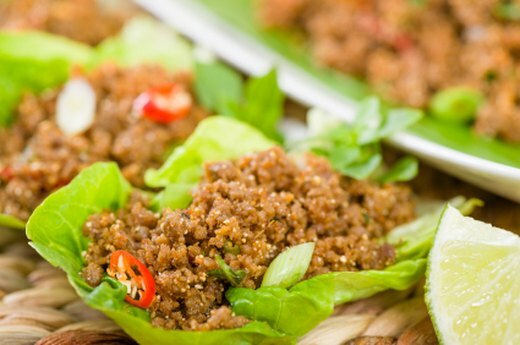 Let us eat lettuce wraps, that is. Start with a head of iceberg lettuce or long Romaine leafs for the base, then channel your creativity and follow your stomach. Lettuce wraps are versatile, so the contents can include anything from pomegranate seeds to bean sprouts. Vegetarian lettuce wraps topped with creamy avocado and shredded carrots are surefire crowd-pleasers. For meat-lovers, use a pre-cooked rotisserie chicken from your grocer and add cashews or sliced almonds. For dipping sauce, mix soy sauce, garlic powder and add red pepper flakes for a kick. It’s the height of heirloom tomato season, which means it’s the perfect time to try out a new recipe to showcase this abundant summer produce. For an easy, delectable dinner, use rolls from the bakery. Cut each roll in half and drizzle each flat piece with balsamic vinegar and olive oil. Slice tomatoes and sprinkle with salt and pepper to taste. Complete the meal with Italian flair by adding sliced mozzarella and basil. This dish is not only unbelievably flavorful, but it’s also unbelievably easy since there’s no cooking involved. Lime juice is used to “cook” the fish sans heat. To begin, clean the fish thoroughly and chop into bite-sized pieces. Then let the mixture marinate in the refrigerator for about an hour. White color indicates that the fish is thoroughly “cooked.” Simply add cilantro and anything else that you fancy – peppers, tomatoes, cucumbers, onions – for a cold and refreshing summer dinner. 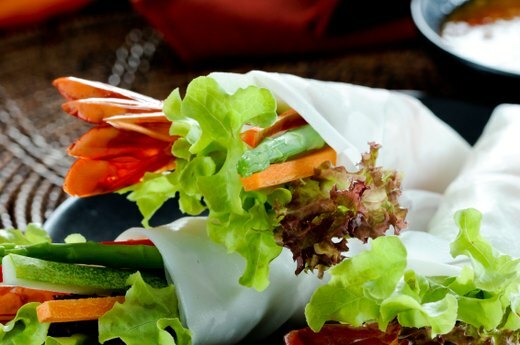 No-cook spring rolls can be customized with any kind of veggies, seafood and meat. The outside of the roll is made of rice paper, which can be found in most grocery stores. Dip the rice paper in warm water, fill with ingredients and roll like a burrito. Add a homemade or store bought dipping sauce to complete your creation. For homemade peanut sauce, mix two parts peanut butter with one part soy sauce and one part coconut milk and add ginger and garlic to taste. Another option? Add Sriracha before rolling and leave out the dipping. 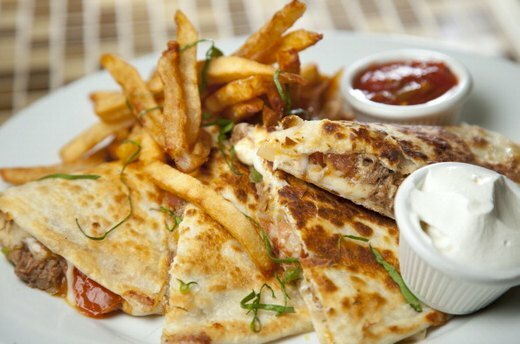 Quesadillas are cheap and easy meals that don’t require a lot of heat. For crispier tortillas, heat on a medium-high skillet for around 6-8 minutes, flipping halfway through. For softer, doughier tortillas, microwave for one minute. You can stick with the classic Mexican cheese variety or get creative. Use Brie with apples, pineapple chunks and walnuts for a sweet spin on this classic dish, or opt for crabmeat, cream cheese and cilantro for a rich and filling quesadilla. If you’re up for a culinary adventure, try using a specialty tortilla, such as spinach, sun-dried tomato or whole-wheat tortillas. 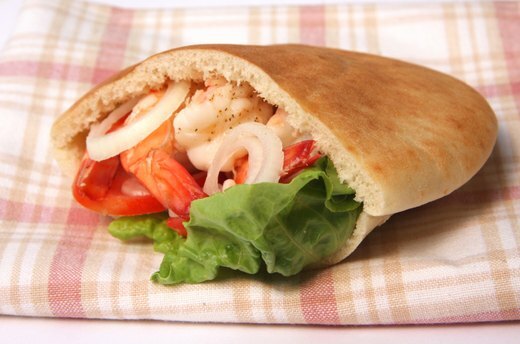 Resistance is futile with these honey-lime shrimp pitas. This full-flavor dish is the result of marinating the shrimp sans heat. To start, combine ¼ cup olive oil with ¼ cup soy sauce, 2 tablespoons of honey, 2 tablespoons of lime juice and garlic salt in a plastic baggie. You can add black pepper, paprika or red pepper flakes for more kick. Add your shrimp to the bag, shake and let marinate in the fridge for a half hour. Stuff other garnishes, such as lettuce, tomato and cucumber, in the pocket. Simply add shrimp and chow down! Watching your neighbor flip burgers on the grill every night? Don’t be green with envy! You don't need to be a barbecue expert to prepare grilled veggies. Asparagus, cucumbers, bell peppers and zucchini make for a delicious and healthy meal on their own or a perfect side dish for grilled meat. 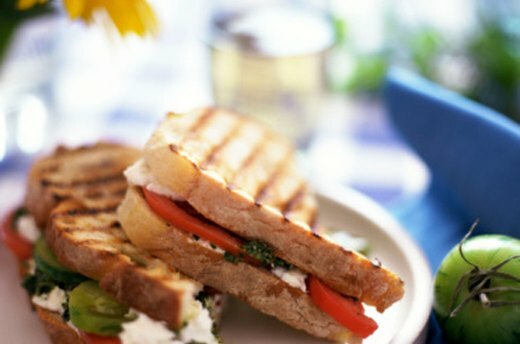 Preheat your barbecue on medium heat, cut veggies and brush with olive oil or butter. Sprinkle with oregano, curry and lemon pepper seasoning. Grill until charred and remove. You can also add a dash of Parmesan cheese on top. 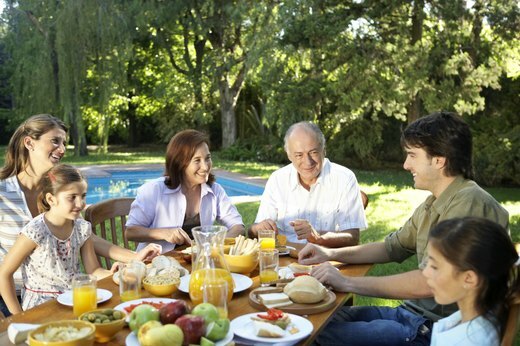 Enjoy the products of your grilling talents! 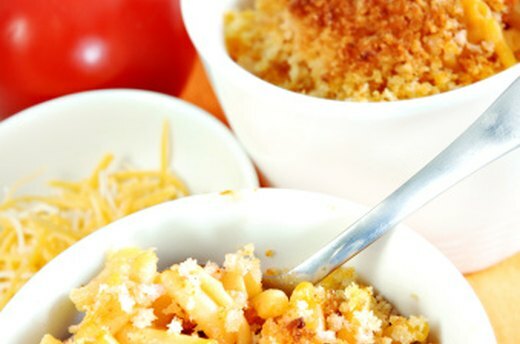 With a quick cook time and no oven required, this comfort food doesn’t disappoint. Melt butter in a skillet over medium heat -- add onions and salt and pepper, if desired. Once butter is melted, add two cups half and half cream, one tablespoon flour and noodles. Stir and simmer noodles until soft. Add your preferred cheese(s) and you’ve got yourself a deliciously easy summer dinner. You can even add bacon or breadcrumbs on top for a crunchy crust. This tasty explosion comes together in around ten minutes – all without the oven! Stuffed sweet potatoes can be dressed just as baked russet potatoes with cheese and sour cream, or you can create your own unique version of this classic dish. Black beans, red onions, corn and cilantro make for an excellent Southwestern-inspired volcano, or use spinach and sausage for a protein packed post-workout dinner. Just wash the potatoes thoroughly, place on a paper towel, and microwave for about ten minutes, flipping halfway through. To finish, fill with your “lava” of choice. You can even use Greek yogurt and cinnamon for a sweeter meal. This ain’t your picnic’s watermelon! 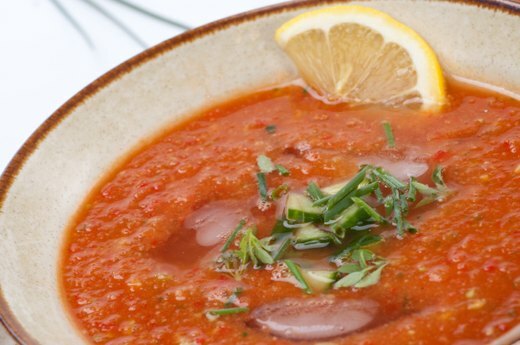 The red fruit puts a new spin on this classic summer soup. Use a medium seedless watermelon, finely diced, for the base. Then add cucumber, red bell pepper, basil and shallot in a blender or food processor. Puree until smooth, then add watermelon slowly. Add olive oil, salt and red-wine vinegar until desired taste is achieved. Chill entire mixture, garnish with basil and/or lemon and serve chilled for a summer dinner that will keep you cool.